Dette unike bildet viser HMS "Effingham"s vrak, merket "old wreck" midt i bildet. Fotoet er tatt av et av flyene som fotograferte under "Operation Leader" hvor bl.a. D/S "Rabat"ble senket i 1942. 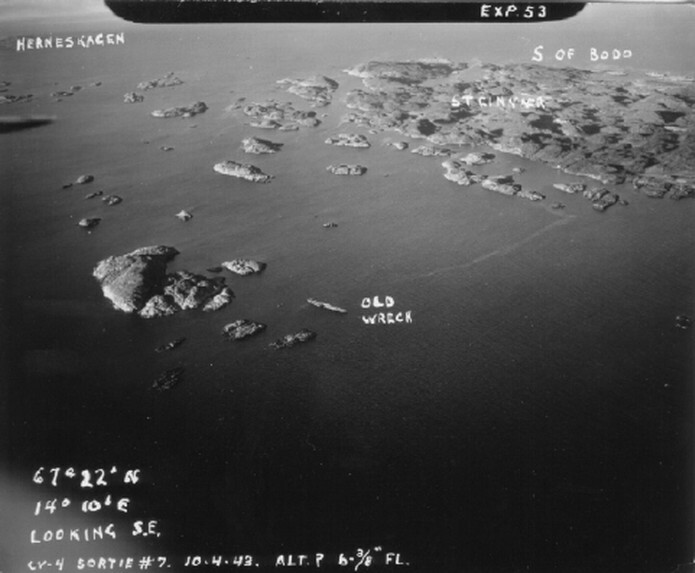 20th Cruiser Squadron, on the circimstances attending the loss of H.M.S."EFFINGHAM". 2. As I stated in my signal 1521 of 19th May, I have not conducted any enquiry here into the loss of "EFFINGHAM"; for many reasons it seemed better not. The Captain and Natigator of that ship went home in s.s. "SOBIESKI". The Commanding Officer of the "MATABELE" is a material witness and is on his way home escorting convoy. med presenningen trukket over akterdekket, klart for inspeksjon av Kong George VI. "Effingham"
og bar flagget til viseadmiral Sir Max Horton da dette bildet ble tatt.